German philologist and writer; born at Hildesheim 1814; died at Hanover July 24, 1870. He studied philology at the University of Göttingen, and then taught for a time in his native city. 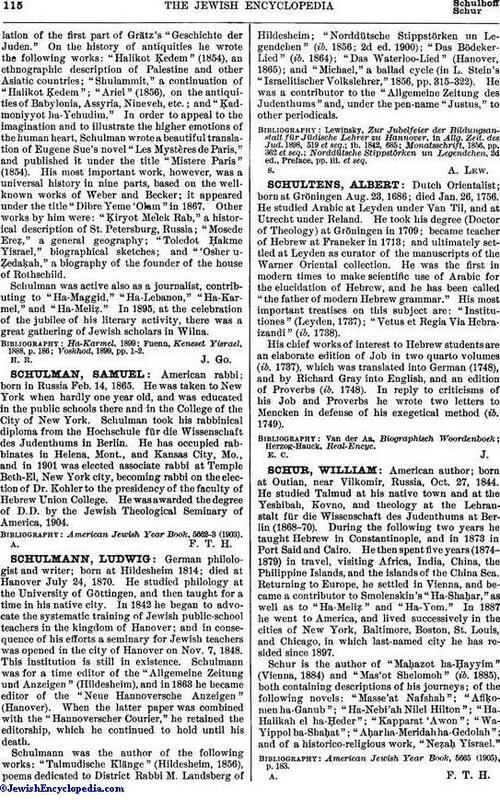 In 1842 he began to advocate the systematic training of Jewish public-school teachers in the kingdom of Hanover; and in consequence of his efforts a seminary for Jewish teachers was opened in the city of Hanover on Nov. 7, 1848. This institution is still in existence. Schulmann was for a time editor of the "Allgemeine Zeitung und Anzeigen" (Hildesheim), and in 1863 he became editor of the "Neue Hannoversche Anzeigen" (Hanover). When the latter paper was combined with the "Hannoverscher Courier," he retained the editorship, which he continued to hold until his death. Schulmann was the author of the following works: "Talmudische Klänge" (Hildesheim, 1856), poems dedicated to District Rabbi M. Landsberg of Hildesheim; "Norddütsche Stippstörken un Legendchem" (ib. 1856; 2d ed. 1900); "Das Bödeker-Lied" (ib. 1864); "Das Waterloo-Lied" (Hanover, 1865); and "Michael," a ballad cycle (in L. Stein's "Israelitischer Volkslehrer," 1856, pp. 315-322). He was a contributor to the "Allgemeine Zeitung des Judenthums" and, under the pen-name "Justus," to other periodicals. Norddütsche Stippstörken un Legendchen, 2d ed., Preface, pp. iii. et seq.